Browsing back issues of the Sierra Club’s slick magazine recently, I was struck by its marked preference for upbeat anecdotes of small, incremental environmental successes. It did occasionally mention the dire stuff, but only as stout challenges that are being worked on diligently. Evidently, the Sierra Club has made a marketing decision about tone. It’s not Pollyanna-ish (well, some pieces struck me as a bit chirpy, especially the personal profiles of Americans toiling in exotic locales, which carried the odor of pandering to those who hate the idea of giving up pleasure travel to combat CO2 accumulation—which, truth be told, I am among), but it resolutely avoids anything that might be construed as alarmist, or that might daunt the membership. There is room for that, I suppose—bucking up the troops. But such a tone implicitly communicates that we’re doing enough, that by grinding along we can avert the worst. I’m pretty alarmed and daunted, myself. Yet the articles did make me think: What if I’m wrong to feel that way? Is my outlook categorically alienating? What can I report or suggest that would inspire and motivate, or even just comfort and assuage? Because I do think we can avert the worst, or at least are morally obligated to try. So here’s my attempt to be upbeat. 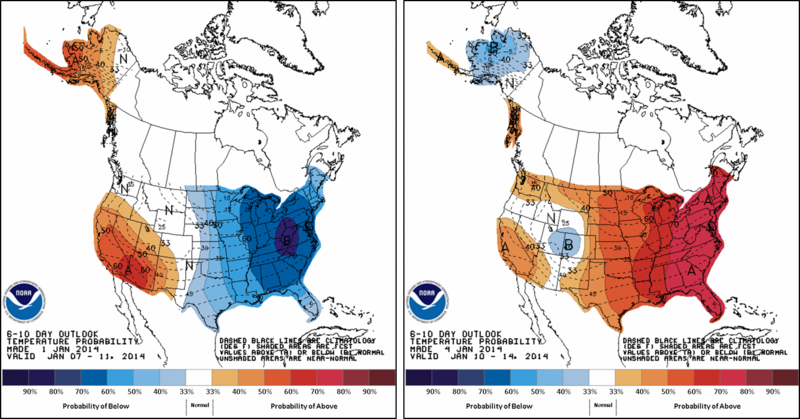 Maybe the summer ice cap won’t disappear. 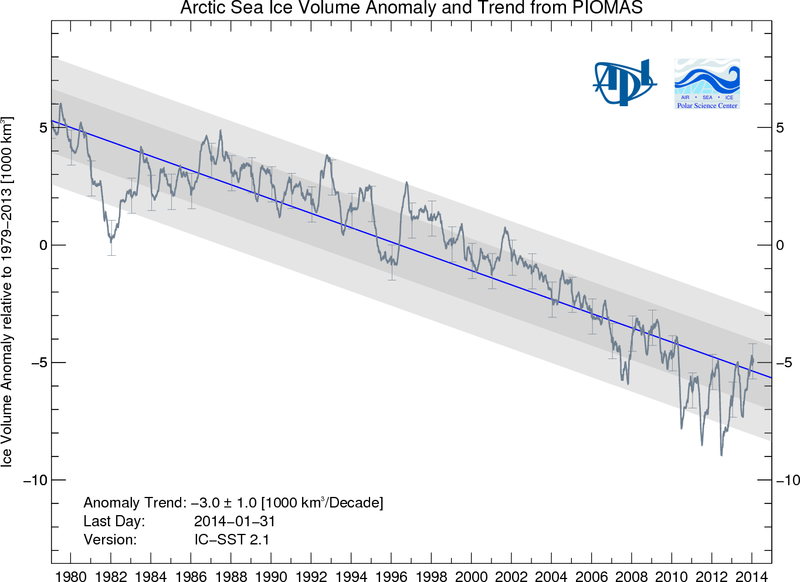 Maybe it’s inaccurate to extrapolate the trendline in the PIOMAS graph of sea ice volume, below. If the ice cap does disappear, maybe it won’t be as soon as 2018. If terrorism and civil strife spike, maybe we’ll be able to counteract them without compounding the reactionary, freedom-destroying measures that we undertook after 9/11. Maybe we’ll be able to keep the NSA under control. If we do further institutionalize the police state, maybe a group of zealous, partisan ideologues with way more effective surveillance technology than we had after 9/11, like GPS tracking in all cell phones and cars, won’t use those capabilities to maintain power and control their political enemies. Something in that sequence must be wrong. See? Positive! I see many people – including environmentalists – who delude themselves about the future. The upbeat tone misleads and misinforms, lulling people into a sense that the problem is smaller and can be managed and distracting from any chance of efforts big enough to tackle it. Indeed, the problem is too big and too late to tackle now in my view – which is why preparing contingency plans seems the most sensible course of action.